Shopping in Branson will be more fun and exciting if you shop at Mulberry Mill located inside the Grand Village Shops in Branson as it offers tons of good kitchen products, gourmet foods and other fashion items. Mulberry Mill features a tasting room stock with exquisite coffees and delicious gourmet foods. The store also has a wide selection of trendy home décor, designer fashions, luxurious bath and body products, and even baby boutique. Mulberry Mill also features a large variety of candles and other home fragrance products, as well as different styles of art works, wall hangings and garden décor. At Mulberry Mill, anyone can get to indulge ultimate shopping experience and enjoy food at its finest at the store’s gourmet tasting room. 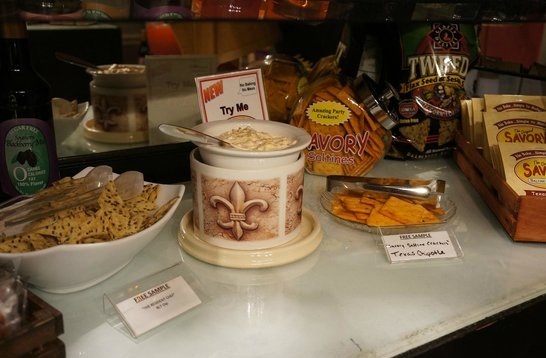 In the tasting room, you’ll find an array of available food items such as cheeseballs, jams, coffees, dips, pastas, soups, and drink mixes which are just a few of the specialties. Want to try a jar of pecan pepper jelly that is made right here in the Ozarks? You only need to spend a few minutes to enjoy free samples that are served daily. Mulberry Mill has been a favorite shopping destination in Branson of tourists and local residents alike for over two decades. In this unique store, you will find a wide variety of shopping items such as fashion wear, jewelry, home décor, purses, scarves, skin care products, candles and many unique gift items. The other side of the store offers gourmet foods, jams, soups, dips, spices, coffee, tea and kitchen accessories. The store also offers multiple free gourmet food samples that are available for tasting every day to help customers in deciding which products to purchase. At Mulberry Mill, you can buy many kinds of kitchen products which include dip chillers, e-cloth, makin’ bacon, salad sac, Silicon lids by Charles Viancin, snapi salad server, tea pitchers and gift certificates. The gourmet foods that you can buy at the store include assortment packs, bread mixes, beverages mixes, cake and cookie mixes, meal mixes, cracker and pretzel seasonings, relish and preserves, seasoning and spices, savory dip mixes, soup mixes, spicy dip mixes, water and tweeds, sweep deep mixes, cheeseballs and cheesecakes. If you are looking for the best place that serves delicious gourmet foods, dips, and sauces, Mulberry Mill is the place to go. Serving food connoisseur since 1995, Mulberry Mill carries a variety of flavors of dips and spices from sweet to savory and everything in between. Mulberry Mill is one of the best food stores in Branson to find gourmet coffees, teas, and ciders with various flavors to choose from and food tastings are offered daily. The best thing about the store doesn’t end here, Mulberry Mill has a beautiful boutique brimming with the latest in fashion and accessories including handmade scarves, jewelry, bath and body products, and trendy home décor. Mulberry Mill is a great place to experience the best shopping in Branson as the store offers tons of kitchen products, gourmet foods, and fashion items.